Well, don’t say I didn’t warn you. You never know when your loyal Enthusiast is going to post – sometimes you’ll get barraged, and sometimes you’ll have a dry spell. Given that I haven’t figured out a way to make a living by blogging yet, the job that actually pays me has made it a little difficult to post – which means I either have my priorities straight or all out of whack, depending on your perspective. Anyway, I’m a couple weeks late to this post, but hey, I’m still telling you about a place that’s pretty brand spanking new. But first, some context. It’s pretty much beyond debate that Downtown was and is ground zero for Los Angeles’ cocktail renaissance. Downtown has some of the best drinks in the City served in some of the most well designed rooms in the City. And in case I still need to explain this to any of you, “cocktail renaissance” doesn’t mean “good places to get drunk” any more than going to a great restaurant is about stuffing yourself as full as you can. It’s about quality not quantity, a devotion to craft, and good, valued nights with friends and those closest to you. But it was inevitable that those who created the Downtown scene would bring their talents to the rest of the City (and, incidentally, it’s why the next year is critical to solidify Downtown’s foundation as those who created it move on, which I wrote about previously). It started when Vincenzo Marianella, who is sort of the godfather to many of the City’s mixologists, opened Copa d’Oro in Santa Monica. And a couple other folks moved on as well, like Damian Windsor opening The Roger Room on La Cienega and places like Westside Tavern opened at the Westside Pavilion, which is a restaurant but also serves amazing cocktails. But all of these places seem a little like one-offs. Places that are islands, that those of us in the know seek out, but that few people would find otherwise. In short, they feel less like ripple effects of the cocktail renaissance and more like side projects. But now, a new crop of projects feel more like ripple effects. Places that will actually help show more people what the “cocktail renaissance” is really all about, while not forcing anything on anybody. One of those places is 1886 at the Raymond in Pasadena, which I also wrote about previously. It feels like more a ripple effect because The Raymond is a heritage restaurant that existed way before any of us, and introducing pre-Prohibition cocktails at a place like that will both fit with its overall approach, while introducing people to what the new generation of cocktailians is all about. In a totally different vein, one of the most interesting new places to open along these lines is The Spare Room, at the Hollywood Roosevelt Hotel. 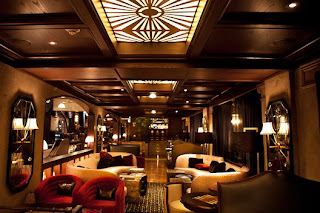 For those of you who haven’t been paying attention, the Roosevelt has rebooted itself into one of the hottest destinations in Hollywood, and has managed to keep itself relevant for a few years now, even as the Lindseys and Britneys of the world who helped put it on the map have self destructed. But what Hollywood nightlife hasn’t been known for is good cocktails. They try to sell fresh juices and quality spirits as having a “quality cocktail menu”, but it just isn’t true. And that’s OK – the clubs do fine, and a quality cocktail program is hard to pull off. The Roosevelt has had the Library Bar going for awhile with great cocktails, but it feels more like a Downtown bar that happens to be in Hollywood rather than a great cocktail place that’s really “of” Hollywood. The Spare Room is a whole different thing. There’s no question that the Spare Room is a Hollywood scene. But at the same time, it’s got an amazing cocktail program – and it’s designed so that you don’t have to wait 20 minutes for a drink. Makes you want to go tomorrow, right? And what’s cool is that the tables turn over and become board games. It’s very “loungey game room”, all Hollywooded up. And what’s cool is that they are totally old school. 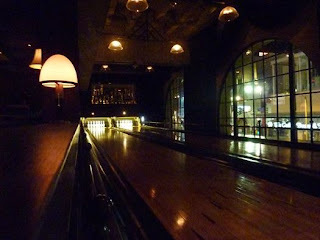 Just lights indicating which pins you knocked down, one lane in between the lanes to deliver your ball back to you, and you keep score on a chalkboard (don’t worry if you don’t know how – they have people who will help you out). And just in case you’re not clear that you’re in a hipster Hollywood joint, the bowling shoes are designed by Esquivel. (in case you’re wondering how all this awesomeness came about, you have Aidan Demerest, formerly of the Edison and First and Hope, to thank, among others). Even bottle service here – one of my pet peeves of the LA nightlife scene – will serve you creative, homemade infused spirits and not just crack open a box and slap a bottle of Grey Goose down. So you owe it to yourself to check this place out, and see the next generation of “good cocktail bars.” There are a couple others that have opened, including the rebooted Les Deux, which will probably be subject of future posts. But I didn’t want to go any longer without sending you to LA’s coolest new destination. And just think, it’s in Hollywood. But go early if you don’t want to have to fight your way in – it’s still Hollywood.